Most of us who have been chewing sticks of Spearmint or Juicy Fruit gum over the last several decades probably assume that the manufacture and sale of gum was what Wrigley was always about. After all, the company, which was founded by William Wrigley Jr., is famous for being the leading gum manufacturer globally, with an array of brands like Orbit, 5, Extra and Winterfresh, to name a few, under its (g)umbrella. However, the backstory to the Wrigley we know today is a winding one, born out of savvy marketing and sales strategies employed by one William Wrigley Jr.
As a boy in Philadelphia, in the late 1860’s Wrigley gained a reputation for being a bit of a prankster and a rebel. After running away from home then getting expelled from school on his return, he was sent to work in his father’s soap factory. 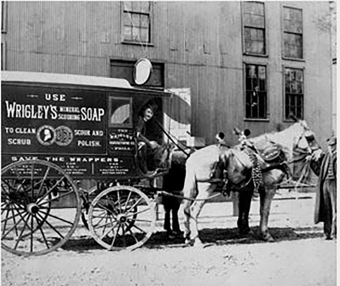 Young Wrigley soon extricated himself from the daily grind which involved stirring the vats of soap, and by the tender age of 13 he became a soap salesman for his father instead. As a salesman, Wrigley found his niche, showing a flair for sales and advertising (a true son of the soapbox) that would become rather legendary after he branched out to form his own company William Wrigley Jr. Company in Chicago in 1891. Most accounts say that he only had $32 in his pockets when he founded his now world famous company. Whether that’s true or not, he had other money besides what fit in his pockets, with Wrigley’s website mentioning his uncle gave him a check for $5,000 (about $130,000 today) to help get his new company up and running. That business was not gum, however. 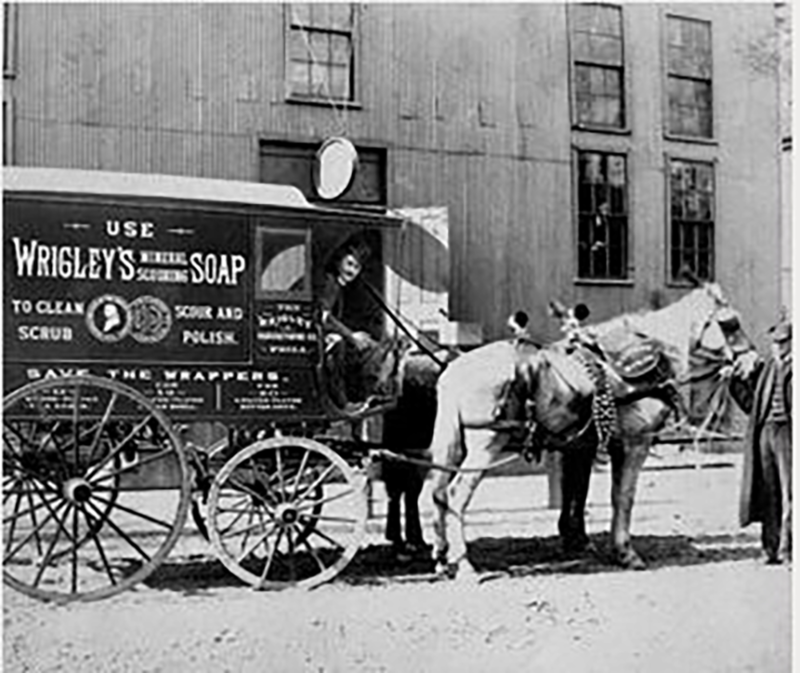 Wrigley started out by doing what he knew best- selling his father’s soap, Wrigley’s Scouring Soap. But he added an innovative twist that was representative of an approach that would have a far reaching impact on his future. Since merchants resisted carrying his goods due to the low profit margins, Wrigley came up with a plan to add a little something extra in the form of free gifts. These gifts ranged from umbrellas to baking powder. As cake baking methods had changed in the mid-19th century and baking powder was a big part of that, it was no surprise that sales took off. With the baking powder itself being a huge hit as a freebie, Wrigley moved on from specializing in soap to baking powder, but still continued to offer freebies. This time around, it was baking powder with free chewing gum thrown in. Soon, the chewing gum was eclipsing the baking powder in popularity. Adaptable as ever, Wrigley abandoned baking powder for selling chewing gum, the product that the company is famous for today. The gum Wrigley was selling in the 1890’s was manufactured by Zeno Company. Distinguishing the product a bit, Wrigley recommended that Zeno use chicle to make the gum instead of the paraffin and spruce that were the traditional ingredients of the day. Then he focused on expanding chewing gum’s appeal to a younger demographic. Wrigley started with Vassar and Lotta gum and by 1893 at the World’s Columbian Exposition introduced a sweet, fruity flavor that is still one of the big names in the chewing gum business today, Juicy Fruit. (See: Is There Any Fruit in Juicy Fruit?) A few months later, he rolled out Wrigley’s Spearmint. 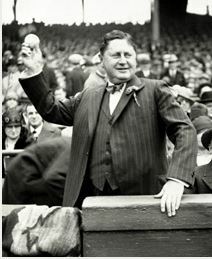 For the rest of the decade and into the 20th century, William Wrigley wore his promoter hat with vigor, traveling across the country again and again. He didn’t discontinue the premium offers though, combining gum with other items like lamps, pocket knives, fishing tackle and measuring scales. Understanding that purchasers bought gum impulsively, he also proposed placing the gum display cases in a place that is very familiar to us today – beside the checkout counter – and retailers agreed. By 1907, when the country was grappling with a financial crisis and other gum manufacturers were cutting costs, Wrigley literally bet his life savings on his then fledgling company, mortgaging everything he owned and buying $250,000 (about $6.2 million today) worth of advertising. This was the springboard from which he launched his company to nationwide fame. His competitors’ sales stagnated, while his soared with Wrigley Spearmint’s sales alone jumped to more than $1 million a year following the ad blitz. In total, the general sales for the company leapt from $170,000 to $3 million (about $75 million today). That same year, Wrigley wanted to offer stock to his employees so took the company public. Capping off a remarkably successful career, Wrigley became chairman of the board and turned the presidency over to his son, Philip in 1925, ultimately passing away in 1932 at the age of 70 with an estimated net worth of $34 million or about $582 million today. 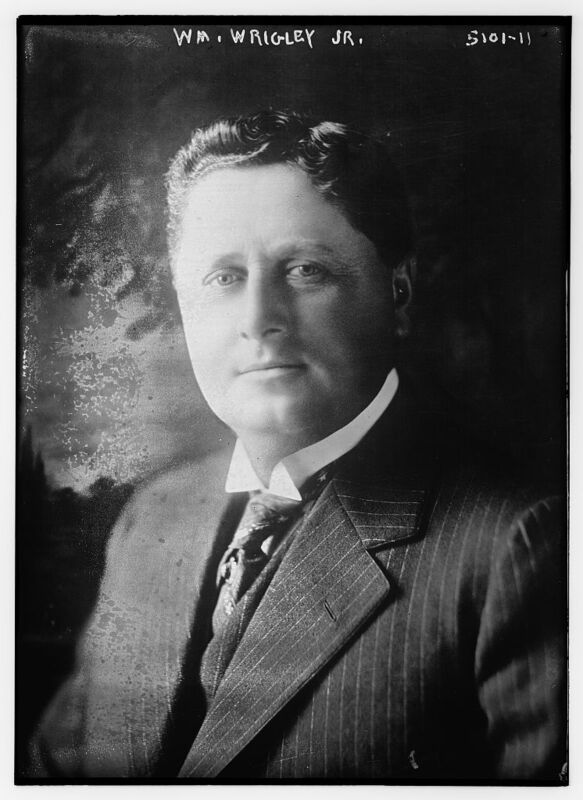 Wrigley Field, home of the Chicago Cubs, is named after William Wrigley Jr. who first bought a minority share in the Chicago Cubs in 1914 and then became the majority owner in 1921. William Wrigley Jr. Company was one of the first major companies, along with Ford, to offer its employees a five day work week, starting in 1924. (See: The Five Day Work Week and Why is a Typical Work Day Eight Hours Long?). For reference, despite some industries in the United States, such as the Boston Ship Carpenters, managing to achieve eight hour work day all the way back in 1842, the average work week in the United States in 1890 was around 90-100 hours per week for most building tradesmen according to a survey done by the federal government at that time. tagged with Chewing Gum, Juicy Fruit, Spearming, William Wrigley Jr. These days adults generally don’t allow two year olds to chew gum in case they swallow it. I wonder why this was acceptable back then?